Hi everyone! Jen here with Day of the September Diva Dare!! So what we're daring you to create this month is a card or project using inspiration from a tic-tac-toe board. For example: x’s and o’s, hugs & kisses, squares, circles, grids, you get the idea. I knew I wanted to make a card that was clean and simple so I started with a kraft card base and then spotted my black polka dot washi tape and the card just sort of fell together. I love black, red and kraft together! I used Love Notes for all the stamping alternating between the hearts and XOXO's to fill in the board. I finished the board by tying twine around the winning row and adding a tag made from one of the Banner Bundle Die Set dies stamped with I <3 You. I then distressed the edges and popped the main layer up on foam tape. It was so quick and easy and I love how it turned out! Deadline to link your cards is 8PM Mountain on Wednesday, September 25th. Entries must be new (posted 9/6 or later), include at least one Verve product, include inspiration from a tic-tac-toe board, and be linked up to the linky widget by 8pm Mountain on 9/25/13. Win a $40 Gift voucher to Verve Stamps! Take our "Tic-Tac-Toe" Dare and link up your card (created September 6th or later) to the linky widget below to be eligible to win. One participant will be randomly selected to win the gift voucher. You can enter as many times as you like, but each card needs to be in a separate post. Win a set of your choice! 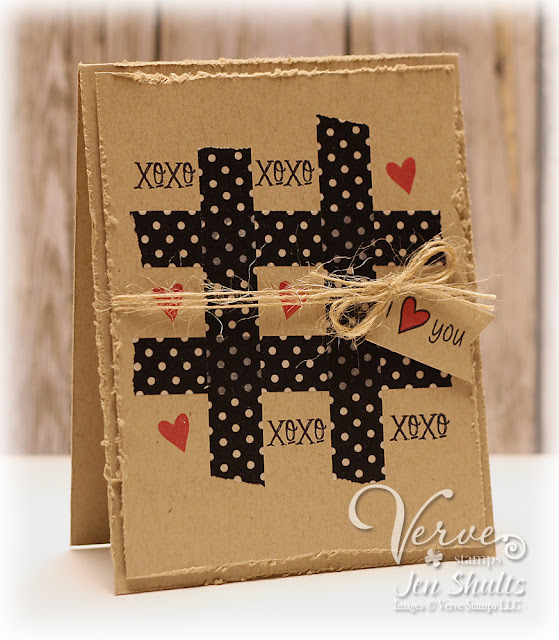 For another chance to win some new Verve, leave a little comment love on our design team's "Tic-Tac-Toe" Diva Dare posts! One lucky commenter will win a Verve stamp set of his or her choice, so be sure to tune in each day! Comment deadline to be entered in our prize drawing is September 25, 2013. Winners will be announced on September 26, 2013.